These short radio pieces detail the circumstances, meaning, and personalities of the favorite Mardi Gras songs in New Orleans. These radio pieces portray the history, recordings, and people behind the musical standards of New Orleans Mardi Gras. The interview subjects include musicians, Mardi Gras Indians, and other participants talking about what these songs mean, how they were recorded, and other details. 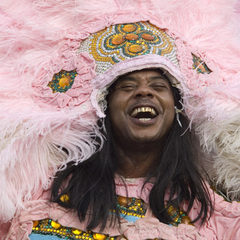 A brief profile of the Mardi Gras classic "Street Parade" with interviews with singer and songwriter Earl King and bassist George Porter Jr.
A short profile with Big Chief Bo Dollis and keyboardist Willie Tee of the Mardi Gras classic "New Suit." This short piece talks with pianist Art Neville and drummer John Boudreaux about the Mardi Gras standard "Mardi Gras Mambo." A short documentary featuring pianist Art Neville and bassist George Porter Jr. about the Mardi Gras standard "Indian Red." In this short piece, the musicians who participated in the recording of the Mardi Gras standard "Handa Wanda" recall its origins and recording.